Autoimmune disease is an epidemic in our society, affecting an estimated 50 million Americans. But it doesn’t have to be. Although genetic predisposition accounts for approximately one-third of your risk of developing an autoimmune disease, the other two-thirds comes from your environment, your diet, and your lifestyle. In fact, experts are increasingly recognizing that certain dietary factors are key contributors to autoimmune disease, placing these autoimmune conditions in the same class of diet- and lifestyle-related diseases as type 2 diabetes, cardiovascular disease, and obesity. This means that autoimmune disease is directly linked to our food choices and how we decide to live your life. It also means that we can manage and reverse autoimmune disease simply by changing how you eat and making more informed choices about sleep, activity, and stress… and that’s some pretty darned good news! There are more than one hundred confirmed autoimmune diseases and many more diseases that are suspected of having autoimmune origins (download a complete list here). The root cause of all autoimmune diseases is the same: our immune system, which is supposed to protect us from invading microorganisms, turns against us and attacks our proteins, cells, and tissues instead. Which proteins, cells, and tissues are attacked determines the autoimmune disease and its symptoms. In Hashimoto’s thyroiditis, the thyroid gland is attacked. In Rheumatoid Arthritis, the tissues of your joints are attacked. In psoriasis, proteins within the layers of cells that make up your skin are attacked. However, the root cause is the same. 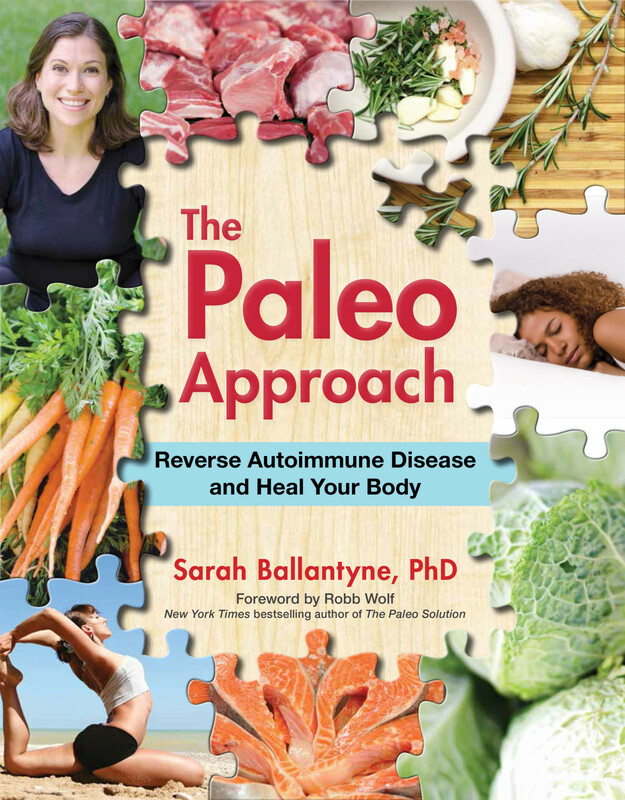 The Paleo Autoimmune Protocol, typically abbreviated AIP, is a powerful strategy that uses diet and lifestyle to regulate the immune system, putting an end to these attacks and giving the body the opportunity to heal. The Autoimmune Protocol, or AIP, is a specialized version of the Paleo diet, with an even greater focus on nutrient density and even stricter guidelines for which foods should be eliminated. Foods can be viewed as having two kinds of constituents within them: those that promote health (like nutrients!) and those that undermine health (like inflammatory compounds). (While there are constituents that neither promote nor undermine health, they are not used to evaluate the merit of an individual food.) Some foods are obvious wins for a health-promoting diet because they have tons of beneficial constituents and very few or no constituents that undermine health—good examples of these superfoods are organ meats, seafood, and most vegetables. Other foods are obvious fails because they have a relative lack of health-promoting constituents and are rife with problematic compounds—good examples are gluten-containing grains, peanuts, and most soy products. But many foods fall into the amorphous world of gray in between these two extremes. Tomatoes, for example, have some exciting nutrients, but they also contain several compounds that are so effective at stimulating the immune system that they have been investigated for use in vaccines as adjuvants (the chemicals in vaccines that enhance your immune response to whatever you’re getting immunized against). The biggest difference between a standard Paleo diet and the Autoimmune Protocol is where we draw the line between “yes” foods and “no” foods in order to get more health-promoting compounds and fewer detrimental compounds in our diet. Those who are typically quite healthy can tolerate less-optimal foods than those who aren’t. You can think of the Autoimmune Protocol as a pickier version of the Paleo diet; it accepts only those foods that are clear winners. As such, the Autoimmune Protocol places greater emphasis on the most nutrient-dense foods in our food supply, including organ meat, seafood, and vegetables. And the Autoimmune Protocol eliminates foods allowed on the typical Paleo diet that have compounds that may stimulate the immune system or harm the gut environment, including nightshades (like tomatoes and peppers), eggs, nuts, seeds, and alcohol. The goal of the Autoimmune Protocol is to flood the body with nutrients while simultaneously avoiding any food that might be contributing to disease (or at the very least interfering with our efforts to heal). It is an elimination diet strategy, cutting out the foods that are most likely to be holding back our health. After a period of time, many of the excluded foods, especially those that have nutritional merit despite also containing some (but not too much) potentially detrimental compounds, can be reintroduced. While the Paleo diet is sometimes labeled as a fad diet, its health benefits are supported by scientific research. The body of research pitting Paleo against other dietary strategies is in its infancy, but the studies that have been performed uniformly support Paleo. They prove that it beats out other recommended diets, even the Mediterranean diet, for weight loss, management of diabetes, improvement of cardiovascular disease risk factors, and reversal of metabolic syndrome. Studies have also shown that it has therapeutic potential for the debilitating autoimmune disease secondary progressing multiple sclerosis. And while anecdotal stories cannot be used to validate any dietary approach, the tens of thousands (and counting!) of people who have successfully used variations of the Paleo diet, including the Autoimmune Protocol, to mitigate and even completely reverse their diseases is compelling. See Paleo Diet Clinical Trials and Studies. In a recent study, fifteen patients with active inflammatory bowel disease were placed on the Paleo Autoimmune Protocol following a 6-week gradual transition followed by a 5-week maintenance phase. (In fact, patients were given my first book, The Paleo Approach, as a resource for following the protocol.) Clinical remission was achieved by week 6 in eleven of the fifteen participants (73%!! ), and they stayed in remission throughout the 5-week maintenance phase of the study. How Does The Autoimmune Protocol Work? Nutrient density. The immune system (and indeed every system in the body) requires an array of vitamins, minerals, antioxidants, essential fatty acids, and amino acids to function normally. Micronutrient deficiencies and imbalances are key players in the development and progression of autoimmune disease. Focusing on consuming the most nutrient-dense foods available enables a synergistic surplus of micronutrients to correct both deficiencies and imbalances, thus supporting regulation of the immune system, hormone systems, detoxification systems, and neurotransmitter production. A nutrient-dense diet further provides the building blocks that the body needs to heal damaged tissues. Gut health. Gut dysbiosis and leaky gut are key facilitators in the development of autoimmune disease. The foods recommended on the Paleo Autoimmune Protocol support the growth of healthy levels and a healthy variety of gut microorganisms. Foods that irritate or damage the lining of the gut are avoided, while foods that help restore gut barrier function and promote healing are endorsed. Hormone regulation. What we eat, when we eat, and how much we eat affect a variety of hormones that interact with the immune system. When dietary factors (like eating too much sugar or grazing rather than eating larger meals spaced farther apart) dysregulate these hormones, the immune system is directly affected (typically stimulated). The Paleo Autoimmune Protocol diet is designed to promote regulation of these hormones, thereby regulating the immune system by proxy. 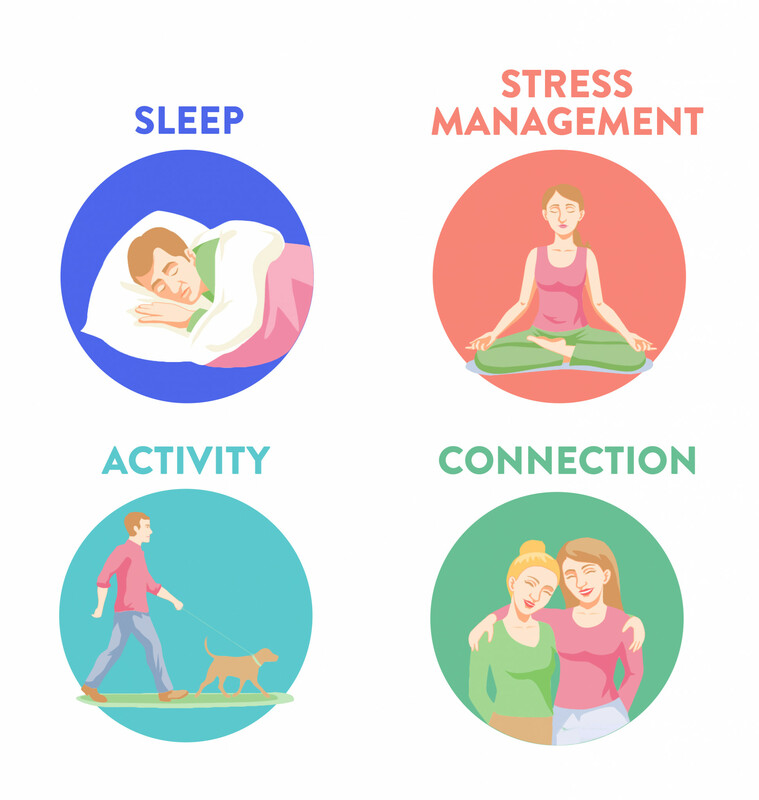 These and other essential hormones that impact the immune system are also profoundly affected by how much sleep we get, how much time we spend outside, how much and what kinds of activity we get, and how well we reduce and manage stress. Immune system regulation. Immune regulation is achieved by restoring a healthy diversity and healthy amounts of gut microorganisms, restoring the barrier function of the gut, providing sufficient amounts of the micronutrients required for the immune system to function normally, and regulating the key hormones that in turn regulate the immune system. Inflammation is a factor in all chronic illnesses, and this is one area where the foods we eat can make a huge difference. In some cases, an immune system that isn’t regulating itself properly directly causes the illness; in others, inflammation is merely an element of the illness or a contributor to how the illness came about—but it is always a player and a problem. What this means is that reducing inflammation and giving the immune system the resources it needs, as well as the opportunity to regulate itself, can help in every single chronic illness. This is important because inflammation is strongly influenced by what we eat, how well we sleep, how stressed we are, and how active we are. And this is why chronic illness can respond so positively to changes in diet and lifestyle. Food has therapeutic potential for every chronic illness—but that’s not the same thing as calling food a cure. Depending on the illness you’re struggling with, how long you’ve had it, how aggressive the disease is, and what confounding factors you’re dealing with, dietary changes may get you as far as a complete reversal of your disease, or they may slow the progress of your illness, or they may simply improve your quality of life. These are all successes worth celebrating. Good food may not be the miracle cure you’re hoping for, but it’s pretty darn powerful all the same. As you adopt the Paleo Autoimmune Protocol, your food choices become focused on consuming the nutrients to support this healing—foods that provide everything your body needs to stop attacking itself, repair damaged tissues, and get healthy again: proteins, carbohydrates, and fats to sustain a normal metabolism, build new tissue, and produce hormones, important proteins, and signaling molecules; and the full range of fat-soluble vitamins, water-soluble vitamins, minerals, and antioxidants to get rid of inflammation, regulate the immune system, and support the normal functioning of all the body’s systems. Following the AIP diet involves increasing your intake of nutrient-dense, health-promoting foods while avoiding foods that may be triggers for your disease. probiotic/fermented foods (fermented vegetables or fruit, kombucha, water kefir, coconut milk kefir, coconut milk yogurt, supplements)–read about them here and here. This diet is appropriate for everyone with diagnosed autoimmune disorders or with suspected autoimmune diseases. It is very simply an extremely nutrient-dense diet that is devoid of foods that irritate the gut, cause gut dysbiosis and activate the immune system. You will not be missing out on any nutrients and this diet is absolutely appropriate to follow for the rest of your life. If you have a specific autoimmune disease that causes extra food sensitivities, those should be taken into account with your food choices. Don’t forget the crucial importance of: getting enough sleep (at least 8-10 hours every night), managing stress (mindful meditation is very well studied in the scientific literature and universally shown to be beneficial), protecting circadian rhythms (being outside during the day, being in the dark at night and avoiding bright lights in the evening), nurturing social connection, having fun, making time for hobbies, relaxing, and getting lots of mild to moderately intense activity (while avoiding intense/strenuous activity). Read more about the Paleo lifestyle here. The Paleo diet and its stricter, more specific version, the Autoimmune Protocol, can be thought of as nutritional interventions for a diet gone badly awry, overabundant in calories and relatively lacking in vital nutrients. But how well an individual tolerates suboptimal foods—whether we’re talking about something like tomatoes, which are included in the Paleo diet but eliminated on the Autoimmune Protocol, or something like grains, which are not included in either nutritional approach—depends on nutrient status, stress, sleep, activity level, genetics, and health history. As we improve as many of these as possible with diet and lifestyle changes, it’s fairly common to see tolerance of certain foods increase. The Autoimmune Protocol is an elimination diet at its core, rather than a long-term therapeutic diets. It’s designed to cut out the most likely food culprits while flooding the body with nutrients, but reintroductions are an important part of optimizing for lifelong health. So yes, eventually, you get to reintroduce foods that you’ve been avoiding. Select a food to challenge. Be prepared to eat it two or three times in one day, then avoid it completely again for a few days. The first time you eat the food, eat half a teaspoon or even less (one teensy little nibble). Wait fifteen minutes. If you have any symptoms, don’t eat any more. If you don’t, eat one teaspoon of the food (a small bite). Wait fifteen minutes. If you have any symptoms, don’t eat any more. If you don’t, eat one and a half teaspoons of the food (a slightly bigger bite). That’s it for now. Wait two to three hours after eating those small amounts and monitor yourself for symptoms. Now eat a normal-sized portion of the food—either by itself or as part of a meal. Do not eat that food again for five to seven days and don’t reintroduce any other foods during that time. Monitor yourself for symptoms. If you have no symptoms during the challenge day or at any time in the next five to seven days, you may reincorporate this food into your diet. It’s best not to be in a hurry to reintroduce foods. Generally, the longer you wait, the more likely you are to be successful. But when you introduce particular foods is ultimately your choice. How you feel is the best gauge, and only you will know if you are ready. A word of caution, though: don’t let cravings influence you. Your decision should be based on how good you feel and how much improvement you’re seeing in your disease. And to help you out with cravings until you’re ready for this phase, we’ve created some amazing comfort food and treat recipes, so you won’t feel like you’re missing out! The Paleo Approach is the New York Times bestselling complete guide to using diet and lifestyle to manage autoimmune disease and other chronic illnesses. With over 400 pages of scientific explanations of the why’s, what’s, and how’s behind diet and lifestyle recommendations to help regulate the immune system and provide the body with the opportunity to heal. This encyclopedic resource also contains tons of practical information including tips for transitions, working with your doctor, medical test and treatments that might be helpful, troubleshooting, and when and how to reintroduce foods. This book goes into scientific detail, while keeping explanations accessible and fun to read, and includes over 1200 scientific references. This is the book for people who want to understand the contemporary science behind how the food we eat as well as how we live our daily lives together impact our bodies to either promote health or facilitate disease. 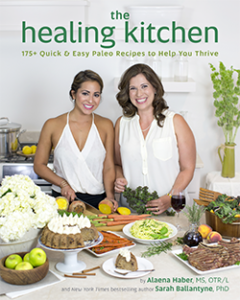 The Paleo Approach Cookbook is the National bestselling companion cookbook to The Paleo Approach! 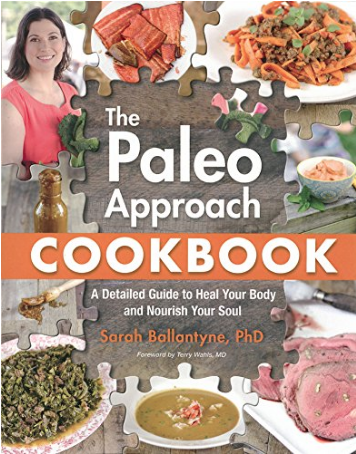 The Paleo Approach Cookbook is over 400 pages and includes over 200 recipes, all strict autoimmune protocol (AIP), and lots of resources (over 100 pages worth!) to help you be successful in the kitchen while you tackle the diet recommendations in The Paleo Approach. With such a huge number of recipes (that each include cook time, prep time, servings, tips, variations, nutrition facts, FODMAP alerts), as well as hundreds of recipe variations, there’s something for everyone! The Paleo Approach Cookbook also includes a summary of the diet, cooking guides, kitchen How-Tos, shopping lists, food storage guides, kitchen tool essentials, cooking glossary of terms, time management strategies, how to read labels, recipe Top Ten, alphabetical Yes-No-Maybe-So list of foods, 6 one-week meal plans (two of which are low-FODMAP) and MORE! Achieving health through nutritious food choices has never been simpler nor more delicious thanks to The Healing Kitchen! This cookbook makes healing using the Autoimmune Protocol completely accessible to everyone, regardless of your budget, time limitations, or access to specialty grocers. Armed with more than 175 budget-friendly, quick and easy recipes made with everyday ingredients, you get to minimize time and effort preparing healthful foods without sacrificing flavor! 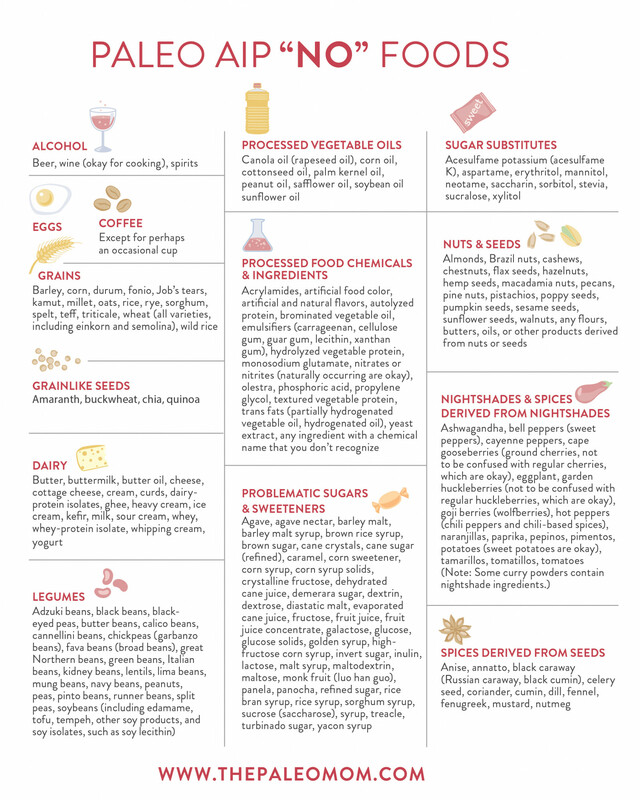 Straightforward explanations and a comprehensive collection of visual guides will teach you which foods are the best choices to mitigate chronic illnesses, including autoimmune disease. Real-life practical tips on everything from cleaning out your pantry and easy ingredient swaps to reinventing leftovers and DIY flavor combinations will help you go from theory to practice effortlessly. Even better, twelve 1-week meal plans with shopping lists takes all the guesswork out of your weekly trip to the grocery store! 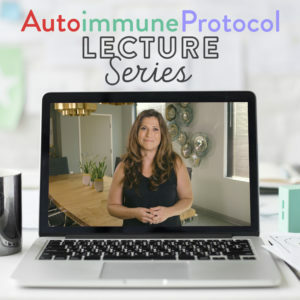 The Autoimmune Protocol Lecture Series is a 6-week video-based, self-directed online course that will teach you the scientific foundation for the diet and lifestyle tenets of the Autoimmune Protocol. Think of this course as going to college for your health! The AIP Lecture Series doesn’t shy away from teaching important scientific concepts. Dr. Sarah Ballantyne, PhD firmly believes that understanding how foods affect our health and the cellular level is an essential motivator for making positive and lasting change, as well as being critical to the self-discovery processes of finding individual tolerance and reintroduction. But, you don’t need a science background to take this course! Dr. Sarah explains the scientific evidence for each facet of the Autoimmune Protocol in her signature approachable style using accessible language and visual guides. If you enjoy Dr. Sarah’s books or articles on this website, you’ll love this course! 1. Starchy Vegetables (GAPS, SCD): Avoiding starchy vegetables for SIBO has not been validated in the scientific literature. Many people do anecdotally find symptom relief from starving overgrowths with these very low carb approaches, but the low carbohydrate/fiber intake can be stressful on the thyroid, cause dysregulated cortisol (and both of those are bad!) and lead to bacterial undergrowth in the digestive tract. While eating low FODMAP has been proven effective symptom management for people with IBS, IBD and SIBO, FODMAP fibers are some of the most important for supporting a healthy and diverse gut microbiome. Low-FODMAP diets should only be followed for a short term (2 to 4 weeks) while medical expertise and treatment is sought. The two diet factors that have been shown in the scientific literature to have the most dramatic corrective impact on gut microorganims is high omega-3 fatty acid intake (lots of fish!) and high fiber intake (from vegetables and fruit), both soluble and insoluble. 2. Insoluble fiber/Leafy Green: While insoluble fiber gets a bad reputation as being an “irritating” fiber, recent studies actually show that higher insoluble fiber intake speeds healing in models of colitis and diverticulitis. Also, the higher the intake of insoluble fiber, the lower the chances someone will have high c-reactive protein (implying that it reduces or prevents inflammation). Soluble fiber reduces the chance of having high c-reactive protein too, but not as much as insoluble fiber. Insoluble fiber also reduces risk of cancer and cardiovascular disease. I can’t find a single scientific journal article that actually shows that insoluble fiber irritates the gut and I have a feeling this is myth. Instead, I can find evidence that it reduces bile acid loss (which ultimately improves digestion), is an essential signal for ghrelin suppression after meals (which has a ton of different important effects in the body), that it improves insulin sensitivity, and helps to remove toxins from the body. I can’t find a single reason why insoluble fiber should be limited. If you have intact pieces of high insoluble fiber vegetables in your stool, add digestive support supplements (especially plant enzymes) and try limiting yourself to cooked vegetables until your digestion improves. For more information, see Part 1, Part 2, Part 3, Part 4 and Part 5 of my Fiber Manifesto series. 3. Goitrogenic vegetables for thyroid disorders: Again, there is no scientific evidence for their exclusion even for those with thyroid disorders. I explain in detail in this post. 4. Fruit: Many people avoid fruit because it is high in sugar. If you have FODMAP-intolerance, you will want to avoid high fructose fruits and everyone will want to keep their fructose intake below 40 grams per day (around 20 grams per day is ideal), but fruit in moderation is endorsed and is actually a great source of vitamins, minerals, fiber and antioxidants. Depending on which fruit you choose, and how you define a serving, you can typically enjoy 2-5 servings of fruit per day. See Why Fruit is a Good Source of Carbohydrates. 5. Omega-3 intake is very important: Aim for between 1:1 and 1:3 ratio of omega-3 fatty acids to omega-6 fatty acids. If you eat grass-fed, pasture-raised meat, not too much poultry, and some fish, this will be natural. If you eat more conventional meat or more frequent servings of poultry, you will need to increase your intake of oily cold-water fish (like salmon, mackerel, sardines, herring, kipper, anchovies, trout, fresh tuna, and carp). Rendered animal fats used for cooking should always come from grass-fed or pasture-raised animals. Omega-3 fatty acid intake is one of the most important factors for correcting gut dysbiosis. It is better to get your omega-3 fats from fresh fish rather than fish oil. Plants-based omega-3s are predominantly ALA, which is not as usable by your body as the long chain DHA and EPA in fish and pasture-raised/grass-fed meat. Increasing omega-3 fatty acid intake has been shown to dramatically reduce the need for NSAIDs in patients with Rheumatoid Arthritis. 6. Protein is important: You can heal your body by limiting your animal-based foods to fish and shellfish, but you need protein. The protein in fish and shellfish is more digestible than meat (and meat protein is more digestible than any protein from plants), which may be relevant for those with severely damaged guts. 8. Gray Areas: egg yolks, legumes with edible pods (such as green beans and snow peas), walnut oil, macadamia nut oil, grass-fed ghee, and gluten-free alcohol when used in cooking are gray areas. I suggest omitting them in the beginning, but can typically be reintroduced much earlier than other foods. Whole coconut products (coconut butter, coconut cream concentrate, creamed coconut, coconut flakes, coconut chips, fresh coconut) should be consumed in moderation (due to being very high in inulin fiber and moderately high in phytic acid). Coconut milk and coconut cream (not to be confused with creamed coconut or coconut cream concentrate) should be guar-gum free and limited to 1 cup per day. Coconut oil is fine if well-tolerated. carob, rooibos tea, black and green tea in moderation, DGL, apple cider vinegar, wine vinegar, balsamic vinegar, coconut water vinegar, coconut water in moderation, vanilla extract (if gluten-free), vanilla bean (ground, powdered, or whole), pomegranate molasses in moderation, maple syrup and maple sugar occasionally, honey, dried fruit very occasionally, dates and date sugar very occasionally, molasses very occasionally, unrefined cane sugar (sucanat, evaporated cane juice, muscovado, very occasionally, coconut aminos, are okay. algae (chlorella, spirulina), wheat grass (contains wheat germ agglutinin), barley grass, brown rice protein, pea protein, hemp protein, licorice root (except DGL), aloe, slippery elm, chia, flax, lemon balm (tea is probably okay but avoid in supplement form), commercial egg replacers, decaf coffee, herbal sleep aids that contain oat seed, some adaptogenic supplements (ashwagandha is a nightshade), are not okay. 10. Meal Composition and Timing. It is better to eat larger meals spaced farther apart and not snack, unless you have a very damaged gut that can not handle digesting large amounts of food all at once. If you are used to grazing, transition slowly. You should not intermittent fast if you have autoimmune disease. You should not endeavor to be in nutritional ketosis if you have an autoimmune disease. You should not eat when under duress. It is better to avoid excessive liquid with your meals, chew your food thoroughly and not rush to the next activity when you eat. You should not eat within 2 hours of bedtime (disrupts sleep). Meals should always include animal foods and plant foods (within the guidelines above), including a quality fat source, and some carbohydrates. There are no firm guidelines for proportion of your meals that are protein, fat and carbohydrate (make sure you get “enough” of each, and then just eat what makes you happy). 12. Quality Matters (but it isn’t everything): the better quality food you can source, the better. But if you just can’t afford all grass-fed/pasture-raised meat, wild-caught fish, and organic locally-grown produce, just do the best you can. My post on the importance of grass-fed meat contains some suggestions for incorporating it into your diet in a budget-conscious way. This post ranks different animal proteins to help you prioritize which ones to buy. Whole9Life has a wonderful chart on when fruits and vegetables are in season including which fruits and vegetables are important to buy organic and which aren’t, if budget is an important concern. 13. Your body knows best: If you know that a food that is omitted from The Paleo Approach works very well for you (such as raw grass-fed dairy) or if you know that a food normally recommended on The Paleo Approach does not work well for you (such as coconut oil), then it’s find to modify accordingly. If you aren’t sure or aren’t seeing success, go with the above recommendations. If you find something that truly works for you, whatever it is, stick with it. 14. Find a great practitioner: Working 1-on-1 with an AIP Certified Coach is a great idea is you need help implementing or refining the Autoimmune Protocol or if you need to troubleshoot. 15. Read 20 Keys to Success on the Autoimmune Protocol for more great tips! For recommendations on books, programs, and blogs to follow, check out my AIP Community page!